So you’ve set the date and now you face another huge decision—where will your celebration take place? Choosing your wedding venue is a difficult task, with many different factors to consider. You want your venue to be unforgettable and make sure it suits your personality, wedding theme, and the size of your party. The number of venues available in the Greater Toronto Area seems to be endless. Whether you are looking for a rustic historical building or a chic downtown event space, there’s something available to meet your needs. Deciding on the right space for your special day and finally imagining what your wedding will really look like is a thrill—try to embrace the process. Here we have narrowed down the heaps of venue choices to the 12 most stunning and unique wedding venues in the GTA. 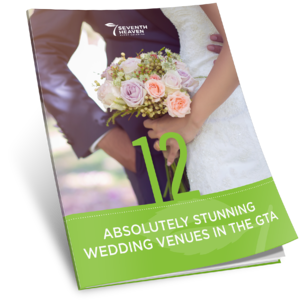 Download this Advanced e-book to learn more about the most beautiful wedding venues in the Toronto area.